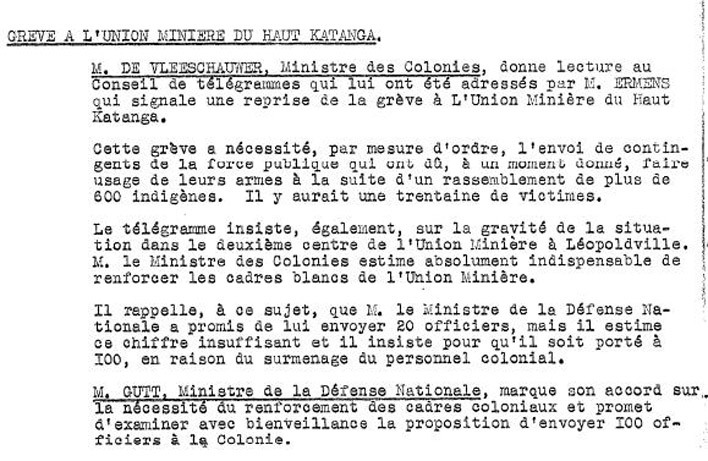 In 1941, a strike broke out at Union Minière in Katanga and was crushed in a bloody fashion by the colonial army. According to the notules of the meeting of 18 December 1941 of the Council of Ministers and of the Pierlot government in London, about thirty strikers lost their lives. Other sources speak of hundreds of victims, among which were women and children. The people went on strike for a higher pay. NAB, Archives of the Council of Ministers. Notules of the meetings, 18 December 1941 (Pierlot government in London).